This shipping fee only applies to shipping within South Africa. The seller may not accept purchases from other countries, and extra shipping costs will apply. Please contact the seller for details. Modern electronics make extensive use of surface mount components, but there is no convenient, affordable, small desktop reflow tool available. ReflowR is a great, small tool to make working with surface mount components just so much easier. Why did you create the ReflowR project? I have hand built hundreds of SMT prototypes and short production runs myself; I have tried and experimented with just about every technique and tool. Two years ago I designed and started to use my own reflowing tool; I was so pleased by how much easier it makes working with, and repairing SMT boards I just had to share it. Get a reflowR and see for yourself. Stress reducing - Less worry that human error will burn your board and ruin your effort and parts. Less worry that thermal shock will make your board fail as soon as it leaves your hands and ruin your reputation. Inspirational teaching/ learning aid - Children( and adults) are inspired more by what they can do, than by what they are shown. Superior even temperature - Unlike heavy cast pans, electric aluminium skillets or toaster ovens that are designed to cook food, the reflowR is designed specifically to heat PCB's. It uses a special, custom wound, large, flat heater element and thick aluminium plate right between the heater and the top plate to spread the heat evenly across the entire PCB without uneven hot and cold spots like with cheap toaster ovens and controller examples. Multifunction - Reflow , Rework, MSD bake or Rework pre-bake. A total of 8 profiles are available from the start button, and the WiFi upgrade adds another 10 profiles from the app interface. Compact and convenient size - Your reflowR can be kept with other desktop tools without occupying excessive space. Access - You have full access to the parts being reflowed while the solder is kept melted to enable small adjustments to fix misalignment. Proper PID temperature control - JEDEC reflow profiles compliant. Small heat capacity and thermal mass, with active cooling and microprocessor control. Delivers fast, accurate temperature rise and fall. LCD Graph Display - In addition to an Android app display, the Large reflowR has a convenient LCD display to view the reflow progress. The smaller Smart reflowR does not have the display. Process monitor and logging - Each of your reflow jobs gets logged for later comparison and inspection. 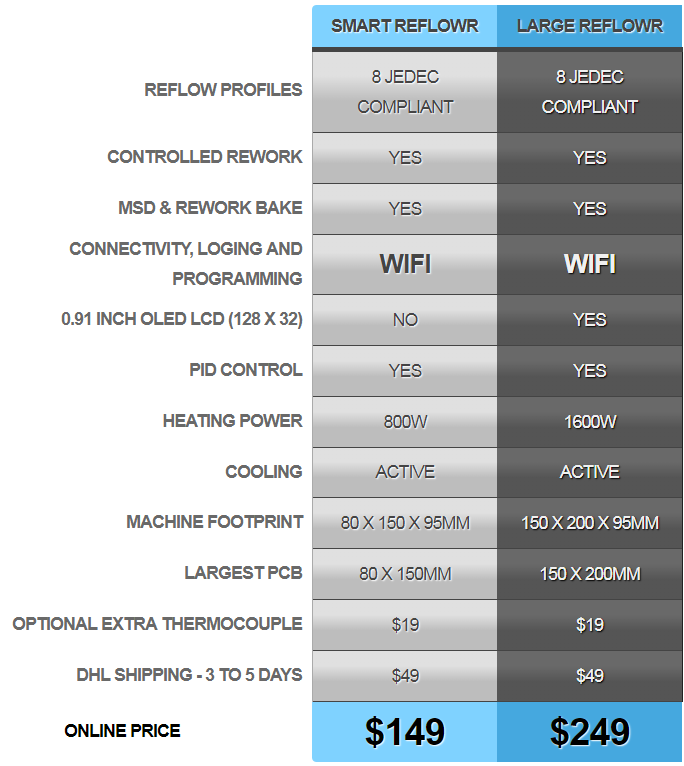 Energy efficient design - Due to the low thermal mass, ReflowR heats your PCB, not your office. Improved reliability - Reliable solder joints and less risk of thermal shock to your components. Improved quality - reflowR won't discolour your boards and your solder joints will be smooth and shiny. Consistency - each board is reflowed almost exactly the same, eliminating human error and variation due to hot spots in skillets and toaster ovens. Superior rework function - Reworking large parts like Quad Flat Packs (QFP) can be problematic when having to apply heat with a hot air pencil or trying to hold a board on a skillet while trying to prod the part with tweezers or a soldering iron, all the while rushing and panicking that you are overheating the part or damaging the board. With a ReflowR the board will be held in place and brought up to just the right temperature so that you can place, and exactly re-align the parts without stress on the part or your nerves. Available and affordable - to the maker, professional or as an educational tool. Android app - The Android app gives a user-friendly interface to monitor, control and program your reflowR. Auxiliary Thermocouple input - provides an external, second thermocouple input to monitor temperature either at the top of the PCB or on large components such as connectors. Consider adding an Auxiliary Thermal Probe Upgrade which includes a K type thermocouple. I ship via DHL express, as a private company they give great service. Delivery is reliable and the fast, normal delivery is expected in 3 to 5 days. In addition to tracking online, and for the utmost confidence DHL sends you an email with detailed tracking information at each step of the process.